A new street sign at Pardee Homes neighborhoods Larimar and Blackstone at The Villages at Tule Springs features a familiar name to those in the homebuilding industry. 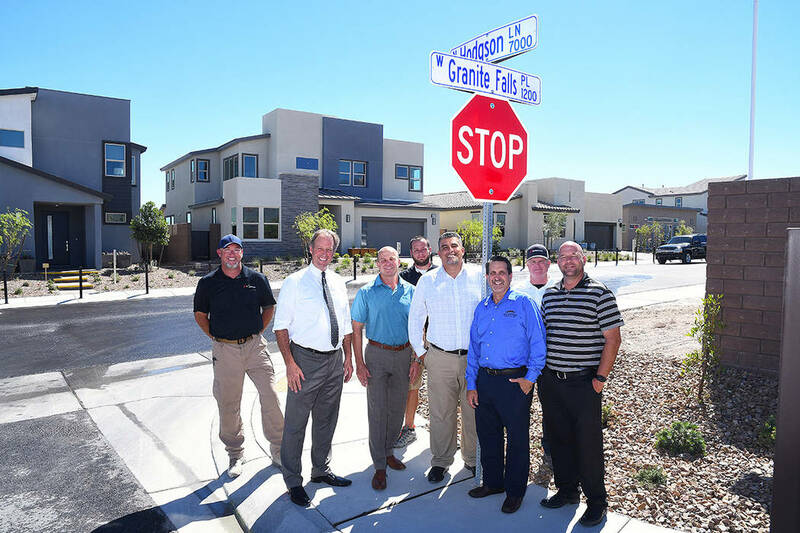 Hodgson Lane was dedicated last month for Southern Nevada Home Builders Association CEO Nat Hodgson in recognition of Pardee’s long-standing support of the SNHBA and of Hodgson. A new street sign at Pardee Homes neighborhoods Larimar and Blackstone at The Villages at Tule Springs features a familiar name to those in the homebuilding industry. Hodgson Lane was dedicated last month for Southern Nevada Home Builders Association CEO Nat Hodgson in recognition of Pardee’s longstanding support of the SNHBA and of Hodgson. North Las Vegas Mayor John Lee joined Pardee Homes Division President Klif Andrews, Vice President of Construction Carlos Zuluaga, General Superintendent Justin Zaricki, superintendents Michael Hudson and Jake Katsos, and Landscape Superintendent Kent Hall to unveil the new street sign, which welcomes guests to Larimar and Blackstone. “Pardee is a proud member of the SNHBA and our employees have held many leadership roles in the organization and HomeAid Southern Nevada for many years,” Andrews said. To reach Larimar and Blackstone from the northern 215 Beltway, exit at Revere Street and head south. Turn right on Dorrell Lane and left on Hodgson Lane to the model homes. Larimar features three large, two-story floor plans, ranging from 2,619 square feet to 3,119 square feet with up to five bedrooms and 3½ baths. Homes start in price from $376,500. Larimar Plan One measures 2,619 square feet with three bedrooms, 2½ baths, den, loft and two-car garage. An optional fourth bedroom is available instead of the den. Plan Two at Larimar measures 2,864 square feet with four bedrooms, three baths, great room, bonus room and three-car garage. An optional fifth bedroom is available instead of the bonus room. Larimar Plan Three measures 3,119 square feet with four bedrooms, 3½ baths, great room, bonus room, den and two-car tandem garage. An optional GenSmart Suite is offered as well as an optional fifth bedroom instead of the bonus room. Blackstone features four floor plans and pricing that starts from $398,000. Blackstone’s single-story Plan One that measures 2,571 square feet with three bedrooms, 2½ baths, great room, den and two-car garage. An optional fourth bedroom is available instead of the den. Blackstone Plan Two measures 3,197 square feet with four bedrooms, 3½ baths, great room, den, loft and two-car garage. A junior master suite is available instead of a fourth bedroom and optional fifth bedroom in lieu of the den. Plan Three at Blackstone measures 3,481 square feet with four bedrooms, including downstairs master, 3½ baths, great room, bonus room, lounge and three-car tandem garage. A second master suite is available in lieu of the bonus room and optional fifth bedroom instead of the lounge. Blackstone Plan Four has five bedrooms, 4½ baths, den, great room, bonus room and three-car tandem garage in 3,892 square feet. A junior master bedroom downstairs is optional. Village Three of The Villages at Tule Springs is anticipated to include more than 1,000 homes, a 35-acre regional park to be built in phases and a city of North Las Vegas police station. Visit pardeehomes.com or call 702-930-8237 to join an interest list or obtain additional information. New Home Gallery hours are 10 a.m. to 6 p.m. Tuesday through Sunday and noon to 6 p.m. on Monday. Pardee Homes Las Vegas builds thoughtfully designed and innovative new homes and communities for first-time through luxury homebuyers. Established in 1921, Pardee Homes was among the first to embrace master-planned community concepts, green homebuilding measures, environmentally sensitive development practice, and customer-focused processes for new-home purchases. Pardee Homes Las Vegas has built more than 40,000 homes throughout Southern Nevada in the last 65 years and is a member of TRI Pointe Group, a family of premium regional homebuilders.